Text messages have been one of the most conventional and preferred way to communicate ever since cellphones become popular. However, with the inception of social messaging apps, traditional messaging has pretty much lost its charm. One of the most common reason we think is the dull interface with just plain text and no effects. Whether you want to wish your friend on his birthday or inform your colleague about an impromptu leave you certainly do not want to speak your mind in plain text. Also Read: 10 iMessage Tips to Make Texting Way More Fun Than Ever! But this is not true in case you are an iPhone user. 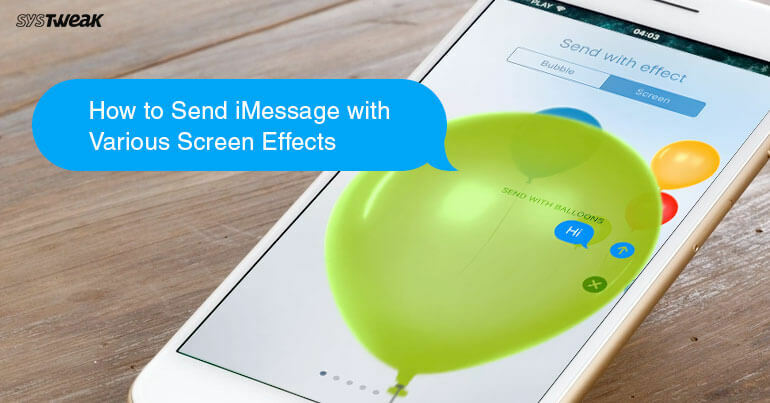 You can add a spark to your iMessage by adding screen effects to it. Though this feature was introduced in iOS 10, however, there are many who are still unaware of how it works. So, if you are one among them, then this article will guide you through. Open Message app by tapping on its icon and select the contact. Now type in the message in the text box. Long press the send button to add screen effect to your messages. This will open another screen containing two options, Bubble and Screen. Now tap on Screen tab. Select any one of the screen effects by swiping left or right. There are 9 screen effects to choose from. Echo: This effect will produce an echo effect for your messages, i.e. your message will be showed various times on the same screen. Spotlight: This effect will throw a focus/spotlight on your message. Balloons: This effect will send balloons of vivid colors along with the text. Confetti: This effect will fill the screen with a stream of Confetti. Love: This effect will send the message with a heart. A perfect effect if you are sending the message to your beloved. Laser: It will fill all the screen with lasers and sound. Fireworks: This effect will start a perfect display of firework on the screen. Shooting Stars: This effect will form a starburst starting from left of your screen to right. Celebration: This effect will fill the screen with various sparkles. A message sent with this effect is enough to express your joy and emotions. From all these effects choose the one which suits the occasion and your mood. Once selected tap on the send button to send your iMessage with vibrant colors and effects. So, guys next time when you are texting your friend on his special day then do not just send plain text, add spark to it by adding special effects.